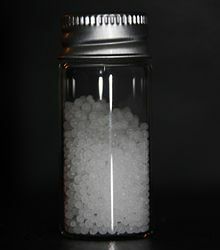 Friedrich Wöhler's discovery in 1828 that urea can be produced from inorganic starting materials was an important conceptual milestone in chemistry. It showed for the first time that a substance previously known only as a byproduct of life could be synthesized in the laboratory without biological starting materials thereby contradicting the widely held doctrine of vitalism. Many soil bacteria possess the enzyme urease, which catalyzes conversion of urea to ammonia (NH3) or ammonium ion (NH4+) and bicarbonate ion (HCO3−). Thus urea fertilizers rapidly transform to the ammonium form in soils. Among the soil bacteria known to carry urease, some ammonia-oxidizing bacteria (AOB), such as species of Nitrosomonas, can also assimilate the carbon dioxide the reaction releases to make biomass via the Calvin cycle, and harvest energy by oxidizing ammonia (the other product of urease) to nitrite, a process termed nitrification. Nitrite-oxidizing bacteria, especially Nitrobacter, oxidize nitrite to nitrate, which is extremely mobile in soils because of its negative charge and is a major cause of water pollution from agriculture. Ammonium and nitrate are readily absorbed by plants, and are the dominant sources of nitrogen for plant growth. Urea is also used in many multi-component solid fertilizer formulations. Urea is highly soluble in water and is therefore also very suitable for use in fertilizer solutions (in combination with ammonium nitrate: UAN), e.g., in 'foliar feed' fertilizers. For fertilizer use, granules are preferred over prills because of their narrower particle size distribution, which is an advantage for mechanical application. Urea can in principle serve as a hydrogen source for subsequent power generation in fuel cells. Urea present in urine/wastewater can be used directly (though bacteria normally quickly degrade urea.) Producing hydrogen by electrolysis of urea solution occurs at a lower voltage (0.37 V) and thus consumes less energy than the electrolysis of water (1.2 V). Urea has also been studied as a diuretic. 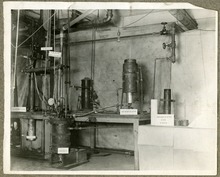 It was first used Dr. W. Friedrich in 1892. In a 2010 study of ICU patients, urea was used to treat euvolemic hyponatremia and was found safe, inexpensive, and simple. Urea labeled with carbon-14 or carbon-13 is used in the urea breath test, which is used to detect the presence of the bacterium Helicobacter pylori (H. pylori) in the stomach and duodenum of humans, associated with peptic ulcers. The test detects the characteristic enzyme urease, produced by H. pylori, by a reaction that produces ammonia from urea. This increases the pH (reduces the acidity) of the stomach environment around the bacteria. Similar bacteria species to H. pylori can be identified by the same test in animals such as apes, dogs, and cats (including big cats). A non-corroding alternative to rock salt for road de-icing. It is often the main ingredient of pet friendly salt substitutes although it is less effective than traditional rock salt or calcium chloride. By action of the urea transporter 2, some of this reabsorbed urea eventually flows back into the thin descending limb of the tubule, through the collecting ducts, and into the excreted urine. The body uses this mechanism, which is controlled by the antidiuretic hormone, to create hyperosmotic urine—i.e., urine with a higher concentration of dissolved substances than the blood plasma. This mechanism is important to prevent the loss of water, maintain blood pressure, and maintain a suitable concentration of sodium ions in the blood plasma. Ureas describes a class of chemical compounds that share the same functional group, a carbonyl group attached to two organic amine residues: RR'N—CO—NRR'. Examples include carbamide peroxide, allantoin, and hydantoin. Ureas are closely related to biurets and related in structure to amides, carbamates, carbodiimides, and thiocarbamides. This was the first time an organic compound was artificially synthesized from inorganic starting materials, without the involvement of living organisms. The results of this experiment implicitly discredited vitalism — the theory that the chemicals of living organisms are fundamentally different from those of inanimate matter. This insight was important for the development of organic chemistry. His discovery prompted Wöhler to write triumphantly to Berzelius: "I must tell you that I can make urea without the use of kidneys, either man or dog. Ammonium cyanate is urea." In fact, this was incorrect. These are two different chemicals, which are in chemical equilibrium heavily favoring urea under standard conditions. Regardless, with his discovery, Wöhler secured a place among the pioneers of organic chemistry. The position of the equilibrium in the carbamate formation/decomposition depends on the product of the partial pressures of the reactants. In the total recycle processes, carbamate decomposition is promoted by reducing the overall pressure, which reduces the partial pressure of both ammonia and carbon dioxide. It is possible, however, to achieve a similar effect without lowering the overall pressure—by suppressing the partial pressure of just one of the reactants. Instead of feeding carbon dioxide gas directly to the reactor with the ammonia, as in the total recycle process, the stripping process first routes the carbon dioxide through a stripper (a carbamate decomposer that operates under full system pressure and is configured to provide maximum gas-liquid contact). This flushes out free ammonia, reducing its partial pressure over the liquid surface and carrying it directly to a carbamate condenser (also under full system pressure). From there, reconstituted ammonium carbamate liquor passes directly to the reactor. That eliminates the medium-pressure stage of the total recycle process altogether. It is fortunate that the urea conversion reaction is slow. If it were not it would go into reverse in the stripper. As it is, succeeding stages of the process must be designed to minimize residence times, at least until the temperature reduces to the point where the reversion reaction is very slow. Normally this reaction is suppressed in the synthesis reactor by maintaining an excess of ammonia, but after the stripper, it occurs until the temperature is reduced. Biuret is undesirable in fertilizer urea because it is toxic to crop plants, although to what extent depends on the nature of the crop and the method of application of the urea. (Biuret is actually welcome in urea when is used as a cattle feed supplement). Ammonium carbamate solutions are notoriously corrosive to metallic construction materials, even more resistant forms of stainless steel—especially in the hottest parts of the plant such as the stripper. Historically corrosion has been minimized (although not eliminated) by continuous injection of a small amount of oxygen (as air) into the plant to establish and maintain a passive oxide layer on exposed stainless steel surfaces. Because the carbon dioxide feed is recovered from ammonia synthesis gas, it contains traces of hydrogen that can mingle with passivation air to form an explosive mixture if allowed to accumulate. In the mid 1990s two duplex (ferritic-austenitic) stainless steels were introduced (DP28W, jointly developed by Toyo Engineering and Sumitomo Metals Industries and Safurex, jointly developed by Stamicarbon and Sandvik Materials Technology (Sweden).) These let manufactures drastically reduce the amount of passivation oxygen. In theory, they could operate with no oxygen. High-quality compound fertilizers containing nitrogen co-granulated with other components such as phosphates have been produced routinely since the beginnings of the modern fertilizer industry, but on account of the low melting point and hygroscopic nature of urea it took courage to apply the same kind of technology to granulate urea on its own. But at the end of the 1970s three companies began to develop fluidized-bed granulation. The first in the field was Nederlandse Stikstof Maatschappij, which later became part of Hydro Agri (now Yara International). Yara eventually sold this technology to Uhde GmbH, whose Uhde Fertilizer Technology (UFT) subsidiary now markets it. Around the same time Toyo Engineering Corporation developed its spouted-bed process, comprising a fluidized bed deliberately agitated to produce turbulent ebullation. Stamicarbon also undertook development work on its own fluidized-bed granulation system, using film sprays rather than atomizing sprays to introduce the urea melt, but shelved it until the 1990s, when there was for a time considerable doubt about the commercial future of the Hydro (UFT) process. As a result, the Stamicarbon technology is now commercialized and highly successful. More recently, Urea Casale introduced a different fluidized-bed granulation system: the urea is sprayed in laterally from the side walls of the granulator instead of from the bottom. This organizes the bed into two cylindrical masses contrarotating on parallel longitudinal axes. The raw product is uniform enough not to require screens. Surprisingly, perhaps, considering the product particles are not spherical, pastillation using a Rotoform steel-belt pastillator is gaining ground as a urea particle-forming process as a result of development work by Stamicarbon in collaboration with Sandvik Process Systems (Germany). Single-machine capacity is limited to 175 t/d, but the machines are simple and need little maintenance, specific power consumption is much lower than for granulation, and the product is very uniform. The robustness of the product appears to make up for its non-spherical shape. Urea dissolved in water is in equilibrium with the isomeric ammonium cyanate. The resulting activity of the isocyanic acid ions do result in carbamylation (formation of long-chain carbamides, liberating ammonia molecule as byproduct) of proteins if proteins are present in the solution too. The carbamylation reaction may occur at elevated temperatures even without catalysts. At room temperature, water solutions of urea are prone to same decomposition reaction in the presence of urease. The isomerization of urea in solution at room temperature without catalysts is a slow process (taking days to reach equilibrium), and freshly prepared, unheated solutions had negligible carbamylation rates. Urea reacts with alcohols to form urethanes. Urea is New Latin from French urée, from Ancient Greek οὖρον ouron, "urine". ^ a b Nomenclature of Organic Chemistry : IUPAC Recommendations and Preferred Names 2013 (Blue Book). Cambridge: The Royal Society of Chemistry. 2014. pp. 416, 860–861. doi:10.1039/9781849733069-FP001. ISBN 978-0-85404-182-4. The compound H2N-CO-NH2 has the retained named ‘urea’, which is the preferred IUPAC name, (…). The systematic name is ‘carbonyl diamide’. ^ "Solubility of Various Compounds in Glycerine" (PDF). msdssearch.dow.com. Archived from the original (PDF) on 2014-04-13. Retrieved 2014-04-12. ^ Loeser E, DelaCruz M, Madappalli V (9 June 2011). "Solubility of Urea in Acetonitrile–Water Mixtures and Liquid–Liquid Phase Separation of Urea-Saturated Acetonitrile–Water Mixtures". Journal of Chemical & Engineering Data. 56 (6): 2909–2913. doi:10.1021/je200122b. ^ Calculated from 14−pKa. The value of pKa is given as 0.10 by the CRC Handbook of Chemistry and Physics, 49th edition (1968–1969). A value of 0.18 is given by Williams, R. (2001-10-24). "pKa Data" (PDF). Archived from the original (PDF) on August 24, 2003. ^ "Urea - Registration Dossier - ECHA". echa.europa.eu. ^ Marsh KL, Sims GK, Mulvaney RL (2005). "Availability of urea to autotrophic ammonia-oxidizing bacteria as related to the fate of 14C- and 15N-labeled urea added to soil". Biology and Fertility of Soils. 42 (2): 137. doi:10.1007/s00374-005-0004-2. ^ Mikkelsen, R.L. (2007). "Biuret in Urea Fertilizers" (PDF). Better Crops. 91 (3): 6–7. Archived from the original (PDF) on 2015-12-22. Retrieved 2015-05-02. ^ Hama H, Kurokawa H, Kawano H, Ando R, Shimogori T, Noda H, Fukami K, Sakaue-Sawano A, Miyawaki A (August 2011). "Scale: a chemical approach for fluorescence imaging and reconstruction of transparent mouse brain". Nature Neuroscience. 14 (11): 1481–8. doi:10.1038/nn.2928. PMID 21878933. ^ Crawford JH, McIntosh JF (1925). "The use of urea as a diuretic in advanced heart failure". Archives of Internal Medicine. New York. 36 (4): 530–541. doi:10.1001/archinte.1925.00120160088004. Retrieved 16 April 2014. ^ Decaux G, Andres C, Gankam Kengne F, Soupart A (14 October 2010). "Treatment of euvolemic hyponatremia in the intensive care unit by urea" (PDF). Critical Care. 14 (5): R184. doi:10.1186/cc9292. PMID 20946646. ^ Diggory PL (January 1971). "Induction of therapeutic abortion by intra-amniotic injection of urea". British Medical Journal. 1 (5739): 28–9. doi:10.1136/bmj.1.5739.28. PMC 1794772. PMID 5539139. ^ Traynor J, Mactier R, Geddes CC, Fox JG (October 2006). "How to measure renal function in clinical practice". BMJ. 333 (7571): 733–7. doi:10.1136/bmj.38975.390370.7c. PMC 1592388. PMID 17023465. ^ Heavy Duty Truck Systems. Cengage Learning. 2015. p. 1117. ISBN 9781305073623. ^ Chlorides—Advances in Research and Application: 2013 Edition. ScholarlyEditions. 2013. p. 77. ISBN 9781481674331. ^ "Optical parametric oscillator using urea crystal". Google Patents. ^ "Urea optical parametric oscillator". AIP Publishing. ^ Coombs A (27 October 2008). "Urea pollution turns tides toxic". Nature. doi:10.1038/news.2008.1190. Retrieved 5 August 2018. ^ Klein J, Blount MA, Sands JM (2011). "Urea Transport in the Kidney". Comprehensive Physiology. Comprehensive Physiology. 1. pp. 699–729. doi:10.1002/cphy.c100030. ISBN 9780470650714. PMID 23737200. ^ Baumgartner M, Flöck M, Winter P, Luf W, Baumgartner W (2005). "Evaluation of flow injection analysis for determination of urea in sheep's and cow's milk". Acta Veterinaria Hungarica. 50 (3): 263–71. doi:10.1556/AVet.50.2002.3.2. PMID 12237967. ^ Greenan NS, Mulvaney RL, Sims GK (1995). "A microscale method for colorimetric determination of urea in soil extracts". Communications in Soil Science and Plant Analysis. 26 (15–16): 2519–2529. doi:10.1080/00103629509369465. The first mention of urea is as "the essential salt of the human body" in: Peter Shaw and Ephraim Chambers, A New Method of Chemistry …, vol 2, (London, England: J. Osborn and T. Longman, 1727), page 193: Process LXXXVII. Boerhaave, Herman Elementa Chemicae …, volume 2, (Leipzig ("Lipsiae"), (Germany): Caspar Fritsch, 1732), page 276. Lindeboom, Gerrit A. Boerhaave and Great Britain …, (Leiden, Netherlands: E.J. Brill, 1974), page 51. ^ Kurzer F, Sanderson PM (1956). "Urea in the History of Organic Chemistry". Journal of Chemical Education. 33 (9): 452–459. Bibcode:1956JChEd..33..452K. doi:10.1021/ed033p452. ^ "Why Pee is Cool – entry #5 – "How Pee Unites You With Rocks"". Science minus details. October 11, 2011. Retrieved August 9, 2016. ^ Kurzer F, Sanderson PM (1956). "Urea in the History of Organic Chemistry". Journal of Chemical Education. 33 (9). p. 454. Bibcode:1956JChEd..33..452K. doi:10.1021/ed033p452. ^ Wöhler, Friedrich (1828) "Ueber künstliche Bildung des Harnstoffs" (On the artificial formation of urea), Annalen der Physik und Chemie, 88 (2) : 253–256. Available in English at: Chem Team. ^ Nicolaou KC, Montagnon T (2008). Molecules That Changed The World. Wiley-VCH. p. 11. ISBN 978-3-527-30983-2. ^ Gibb BC (April 2009). "Teetering towards chaos and complexity". Nature Chemistry. 1 (1): 17–8. Bibcode:2009NatCh...1...17G. doi:10.1038/nchem.148. PMID 21378787. ^ Shorter, J. (1978). "The conversion of ammonium cyanate into urea—a saga in reaction mechanisms". Chemical Society Reviews. 7 (1): 1–14. doi:10.1039/CS9780700001. ^ Kishimoto S, Shimura R, Kamijo T (2008). MHI Proprietary Process for Reducing CO2 Emission and Increasing Urea Production. Nitrogen + Syngas 2008 International Conference and Exhibition. Moscow. ^ "Inorganic Chemicals » AMMONIUM CARBAMATE". Hillakomem.com. 2008-10-02. Archived from the original on 2011-04-05. Retrieved 2010-12-28. ^ a b dadas, dadas. "Thermodynamics of the Urea Process". Retrieved 5 August 2018. ^ Gevers B, Mennen J, Meessen J (2009). AVANCORE – Stamicarbon's New Urea Plant Concept. Nitrogen+Syngas International Conference. Rome. pp. 113–125. ^ "World Class Urea Plants". Nitrogen+Syngas. 294: 29–38. 2008. ^ Nagashima, E. (2010). "Use of DP28W Reduces Passivation Air in Urea Plants". Nitrogen+Syngas. 304: 193–200. ^ Eijkenboom J, Wijk J (2008). "The Behaviour of Safurex". Nitrogen+Syngas. 295: 45–51. ^ "Prills or granules?". Nitrogen+Syngas. 292: 23–27. 2008. ^ Bruynseels JP (1981). NSM's Fluidized-Bed Urea Granulation Process Fertilizer Nitrogen. International Conference. London. pp. 277–288. ^ "Fair Wind for FB Technology". Nitrogen+Syngas. 282: 40–47. ^ "Better product quality". Nitrogen+Syngas. 319: 52–61. 2012. ^ Baeder, Albert. "Rotoform Urea Particles – The Sustainable Premium Product" (PDF). UreaKnowHow.com. Archived from the original (PDF) on 1 February 2014. Retrieved 21 January 2014. ^ "Is UAN the Solution?". Nitrogen+Syngas. 287: 28–30. 2007. ^ Fourcroy and Vauquelin (1799) "Extrait d’un premier mémoire des cit. Fourcroy et Vaulquelin, pour servir à l’histoire naturelle, chimique et médicale de l’urine humaine, contenant quelques faits nouveaux sur son analyse et son altération spontanée" (Extract of a first memoir by citizens Fourcroy and Vauquelin, for use in the natural, chemical, and medical history of human urine, containing some new facts of its analysis and its spontaneous alteration), Annales de Chimie, 31 : 48–71. On page 69, urea is named "urée". ^ Fourcroy and Vauqeulin (1800) "Deuxième mémoire: Pour servir à l’histoire naturelle, chimique et médicale de l’urine humaine, dans lequel on s’occupe spécialement des propriétés de la matière particulière qui le caractérise," (Second memoir: For use in the natural, chemical and medical history of human urine, in which one deals specifically with the properties of the particular material that characterizes it), Annales de Chimie, 32 : 80–112; 113–162. On page 91, urea is again named "urée". ^ Rosenfeld L (1999). Four Centuries of Clinical Chemistry. CRC Press. pp. 41–. ISBN 978-90-5699-645-1. ^ Prout W (1817). "Observations on the nature of some of the proximate principles of the urine; with a few remarks upon the means of preventing those diseases, connected with a morbid state of that fluid". Medico-Chirurgical Transactions. 8: 526–549. ^ Godfrey P, Brown R, Hunter A (1997). "The shape of urea". Journal of Molecular Structure. 413–414: 405–414. Bibcode:1997JMoSt.413..405G. doi:10.1016/S0022-2860(97)00176-2. ^ "Sigma product information sheet - Urea" (PDF). Retrieved 5 August 2018. ^ Sun S, Zhou JY, Yang W, Zhang H (February 2014). "Inhibition of protein carbamylation in urea solution using ammonium-containing buffers". Analytical Biochemistry. 446: 76–81. doi:10.1016/j.ab.2013.10.024. PMC 4072244. PMID 24161613.